Saints' Anglo-Welsh Cup hopes are hanging by a thread after their barren run at Welford Road continued. 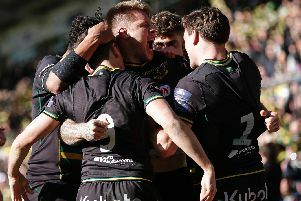 Saints, who have not won at Leicester since February 2007, were beaten 27-20 by Tigers, who bounced back from five successive defeats to secure a comfortable victory. Tigers had bossed the contest from the off, with a strong first 20 minutes ensuring they wiped away the pain caused by the 43-0 home hammering against Glasgow last time out. And though Saints responded with a well-worked Harry Mallinder score, Tigers got the job done in the second half, scoring two more tries. Nafi Tuitavake and Rory Hutchinson did respond with scores of their own, but it was only to be enough for a losing bonus point. It means Saints are second in Pool 1 with just one game to go, at home to Scarlets on Friday night, but Saracens are now three points clear at the top and host Leicester, who have already booked their semi-final spot, next weekend. With only the top team in the pool progressing, it would now appear unlikely that Jim Mallinder's men will make it through. And their frustration was amplified by another defeat to their local rivals, who have now won the past six meetings between the sides. Leicester had enjoyed the lion's share of the early possession and territory, loudly knocking on the door time and again. But Saints held them up three times in quick succession, bringing frustration for the home fans, who were desperate for their team to get some reward for their dominance. It was impressive defiance from Saints, but eventually the pressure told as flanker Will Evans went low and managed to find the gap he needed to ground the ball. Owen Williams converted and the 7-0 lead was no less than Leicester deserved, having bossed the opening 20 minutes of the contest. But Saints responded in stirring fashion as Ken Pisi brilliantly gathered a Sam Olver crossfield kick and offloaded to Tuitavake, who handed it to centre partner Mallinder for the score. Olver fired the conversion well wide to leave his team two points down and Pisi was soon enduring a transformation from hero to villain as he was sin-binned for a tip tackle. Williams landed the resulting penalty to put his team five points up, but Olver soon narrowed the gap to two once again, slotting a big penalty from close to halfway. However, Tigers responded by scoring a fine try, with Harry Wells' tidy offload starting a slick move that was finished by lock Dom Barrow. Williams added the extras to give his team a healthy lead before Pisi returned to the field of play. And Tigers were soon losing a man of their own as referee Dan Jones reviewed an incident and spotted that prop Michele Rizzo had landed a no arms tackle on Sam Dickinson. Tigers were consequently forced to play the first nine minutes of the second half with 14 men, but Williams still had a penalty chance, which he spurned. The home side had seen out the sin bin period unscathed, with Saints providing little threat, and it was soon to get even sweeter for those of a Leicester persuasion. Harry Thacker thought he'd scored and after going to the TMO, Jones awarded the try, despite the fact the replays being seemingly inconclusive. Williams converted and it was a long way back for Saints at 24-8 down with 24 minutes to go. But Tongan centre Tuitavake, who had enjoyed a good game, gave Mallinder's men hope as he popped up to finish off a move with 12 minutes to go. Olver converted to cut the gap to nine points but a Williams penalty five minutes from time made it more comfortable for Tigers. Hutchinson did finish a flowing move in the corner with the final play of the game, but Saints were beaten. Leicester Tigers: Tait (c); Brady, Smith (Worth 69), Roberts, Catchpole; Williams, Kitto (White 76); Rizzo (Brugnara 69), H Thacker (Owen 58), Balmain (Betts 74); Wells, Barrow (Maksymiw 76); Croft, Evans (McGuigan 43), Hamilton. Saints: Tuala; K Pisi, Tuitavake (Hutchinson 70), Mallinder, Estelles (Wilson 51); Olver, Kessell (Dickson 51); E Waller (A Waller 60), Clare (Fish 65), Brookes (Hill 51); Ribbans (Paterson 60), Day (c); Gibson, Nutley, Dickinson (Ludlam 58).